Please accept my application for the position of Climate Change Editor, the details of which I saw on line. For instance, here’s an angle you haven’t so far considered. We could show readers that global warming models have failed at higher rates than Larry King’s marriages. Budget forecasts by President Obama are more accurate than the temperatures predicted by global climate models (GCMs). A smart man would trust a GCM as much as he would a politician’s campaign promise. Five’ll get you twenty, your readers don’t know how lousy the models are. And I’d bet my first-year’s salary (I heard you paid well) that they’ll cheer when reminded that it was once a firm scientific principle that rotten models imply busted theories. In this case it means the existence of serially unskillful GCMs are nearly certain proof that carbon dioxide is not the demon gas its been painted. We’d run this headline: “Wonderful News: Global-Warming-Of-Doom Proved Almost Surely False”. We’d lead with a cheering paragraph that we don’t need to be as nearly panicked as your (and I hope soon my) paper has been. I know what you’re thinking. Same thing our readers will be thinking. “But how can this be? I thought it was certain that the world was soon to end unless massive government programs were instituted?” We’d have them hooked! Guaranteed boost in circulation. I envision a series in which we expose the schemers, hangers-on, band-waggoners, activists, fund-raisers, self-deluded, egos (I almost said “politicians”, which would have been redundant), and even frauds and bamboozlers whose claimed knowledge of fluid physics on a rotating sphere is as artificial as that thing perched on Donald Trump’s cranium. Let’s call out these folks who have turned “climate change” into an unhealthy living. How many times have we heard psychologists, sociologists, philosophers, economists, and other un-trained scientifically ignorant (I use this word in its technical sense) academics lecture us on the horrors that await us under “climate change” when they wouldn’t know a cloud parameterization from a sigma coordinate? I’ll tell you: too often. I do know, though. It is the Times’s tremendous luck that I’m at liberty, ready, and willing to take on this monumental task. Together we can screw people’s heads back on straight and get them to worry about something really important. Like the rise of politics dictating science and the corrupting influence of money. I am an actual bona fide scientist. I have published actual articles in the Journal of Climate, among many others. My specialty is in the value and goodness of models, and the expense and badness of bad science. I’ve written a best-seller (my mom bought two copies) on the subject. Uncertainty: The Soul of Modeling, Probability & Statistics. I know this is a presumptuous questions, but if I get the job can I get this reviewed in the Book Review? Might boost sales. Climate models have the stink of old garlic on them, but they smell like the purest roses next to the putrescence of some models loved by academics drive beyond their ability to resist to publish (or perish). There is limitless material we can mine, exposing scientism, correcting massive over-certainty, putting science back on rational grounds. Given its tone, it’s understandable if you think this application a lark. It isn’t. I’m in earnest. If offered, I’d take the job and do better with it than anybody else you’d find. With me, you’re assured of always getting my true and honest opinion. Bonus: Roger Kimball called me “the civilized world’s most amusing statistician”. Here’s a list of pieces I’ve written at The Stream: https://stream.org/author/williammbriggs/. All these were meant for a general audience. And I have hundreds at my place: http://wmbriggs.com. Many of these are more technical or difficult and do not illustrate how I’d write for a Times audience; nevertheless, the give you an idea of the scope and range of my interests. Look forward to hearing from you. I can start any time. I’m only a few blocks north of your offices. Update In case it’s not clear, I did apply for the job officially, and this is the letter I sent.
.@mattstat Facebook wouldn't let me share this morning; tried several times. Seems to say it was "blocked by [their] security systems." They won’t be able to refuse. The NYT is out to change the world and has stop reporting what has happened. Or at least drops those parts which don’t fit the desired narrative. 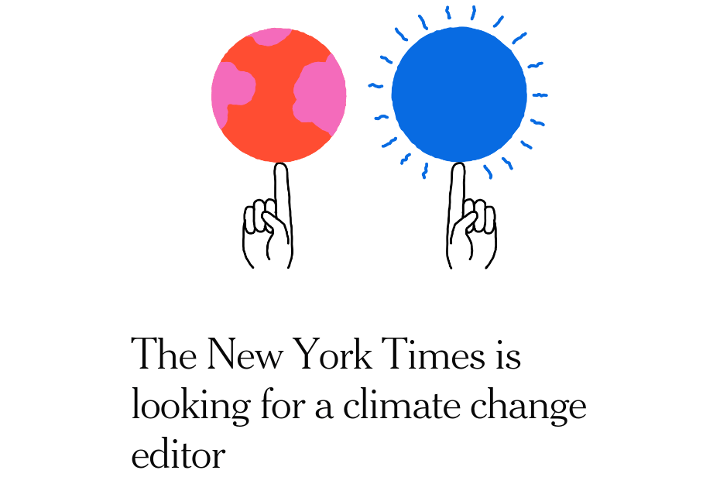 You are out to change the world too but in the wrong direction (to the NYT’s veiwpoint). This letter though may count as one of the required attempts for employment if you are currently receiving unemployment insurance benefits. Your new book already has 15 used copies on Amazon? The day it came out it already had one. I’ve heard some sellers list books they don’t have and when they get a sales request they try and find it. Something like that had to have happened here. I assume your references include Dr. Soon and Lord Monckton ? “Please note this title is print on demand.” I didn’t realize the book was print on demand. “Multiple Copies Available! Ships Today! Money back guarantee! Huge Seller! Millions Sold!” Wow, this seller has a sales line going there. I’m guessing “millions” have not been sold as of yet. Amazon “used” books are sometimes just sales copies, etc, that cannot be technically sold as “new”. Their criteria is quite flexible. The pricing is also “flexible”, with used costing more than new in many cases. As for your application, hope you’re not holding your breath! So far the NYT hasn’t even admitted Hillary has “health issues”, let alone thought about the possibility that global warming is but a scam or a political ideology. Way to go Briggs. Can you just imagine the ensuing conniption fits, heart palpitations, fainting spells and various manifestation of outrage. You have just gotta make this happen. Can we help? Seem to me, in the interest of keeping the Times afloat awhile longer, it might help sell papers if they tried something completely different–like telling the truth. Is it fair if I say, you don’t deserve each other? Briggs, unfortunately the NYTimes isn’t smart enough to hire you. They would look brilliantly prescient to make this hire just as the climate is about to turn colder. Alas, there are none so blind as those who will not see. And a contrarian would make things too lively and generate too much heat from their loyal readers. Any rational publication should want controversy to fuel interest, but they wouldn’t know what to do with that and you would end up let go faster than Rush Limbaugh was dropped from Monday Night Football a few years ago. It would be fun to watch the spectacle. I might even subscribe if they hired you. I hope you intend to publish their response? And why stop at the NYT? It’s clear every newspaper, TV news show, etc., must have a “climate change editor” or equivalent. Maybe there’s an opening on “The View”? I say send copies of this application far and wide. That will likely get some amusing rejection letters you could share. It might get you a regular job. And who knows — maybe the horse will learn to sing. Here’s the only way this could happen; it will require some de-constructive surgery, however. If you were to be a color-blind, Albino- Black, one-legged Lesbian trapped in a man’s body, how could they refuse you? Much as I love your blog, I hate to tell you your enemies have struck again. Your application for a post as an editor is rife with spelling and grammatical errors, which would make it a non-starter. You lost me with the greeting, which is way too judgmental. Couldn’t you have used a greeting that is more fair and just, instead of one based on the standard colonizing assumptions? Did you let them know you self-identify as a yak? They might have an unfulfilled yak-quota. – Big mistake. You should have confirmed their preferred gender with them. By the way, what will you do if Jersey McJones is your boss? Just wondering. JMJ moved to New York? He can’t work from home? I grew up in the NYC metropolitan area, mostly in New Jersey, in the days when it was very polluted. They cleaned it up quite a bit. Huge difference. Like night and day. I wonder, how do you feel about the EPA, Superfund, and stuff like that? Are you just pro-pollution, or what? What is the upside of your argument? What is the bottom line? Some profits for some people and limitless polluting? I thought we were talking about climate change. Did New Jersey get global warmed or did the Superfund fix that? Well, chirp, if you operate under the assumption that pollution can not impact the climate, then maybe you’d think that way, but surely you grasp my point. It would seem utterly irresponsible, just plain stupid, to just allow for completely unregulated and unrestrained polluting. Where is the line with you guys? Good luck. Posted w/o a whimper on Facebook moments ago. JMJ confuses harmless gases with actual air pollution. He may be one of the people who think “smoke stacks” still have smoke coming out. The fact that he continually asks if people want actual air pollution would indicate limited ability to understand reality and an incredibly strong hatred of the right. While complaining about treatment of gays, he continually mocks and demonizes the Right, apparently believing that discrimination and demonizing is okay if it’s his side doing it, just no one else can. It’s a sad affliction, seen in many of the “progressives” of the day. No cure is seen on the horizon for this condition, though reality generally smacks suffers at some point in their lives. Hey!! I’m a “Lesbian trapped in a man’s body” and I take offense to that!! That’s why I have a family and my oldest son (real, not questioning) is starting his sophomore year in collage and my youngest son (real, not questioning) is one of the stars on his baseball team. (Guess he could try softball though). “Collage” as in a confused, orderless juxtaposition / superposition… “Collegium” as in organized body of colleagues. Which is the more apt term, really? Let me know if you need my reference. I’m pretty good at BS. The New York Times? Eewww. Good God, Man, have you no pride? The argument you support is lame. 1 It’s not about pollution. You know this for sure. I have seen you admit it in writing. 2 That is a separate issue. No point talking about upside and downside of a truth. The truth is the truth. What can you or anybody else do about it? 3 Pollution is by very definition bad. That is how it gets a bad name! So you are tilting at windmills and won’t find anybody to argue with you about it except in a kind of false debate. Just like the word toxin or poison. Nobody would argue that these should be banned for reasons too obvious to state. I hope you agree with all of the above. I wish people would stop winding each other up as well. If people care that much they will get off their backsides and do something about it! Something tiny but something. “If we don’t get the science right we will get the policy wrong.” Margaret Thatcher. How about turning over to biofuels which affected food prices and has caused more strain and poverty in places where food is more scarce? Where the next meal is more important than anything else? The best policy must be one which does not force up the basic price of cereals. Africa has a LOT of Coal. Think what they could do with that? Thy are being told ‘don’t touch your coal, don’t touch your oil’. This, and I don’t exaggerate, sickens me. (Not to mention the richer countries, which are the only existent world for many who go along with the AGW polemic. We can have blue skies and daisies without hiding from the truth about the climate’s state and our actual knowledge of it. Can you imagine the uproar if the Grey Lady actually hired you? That, alone, would be so entertaining that I’d contemplate taking the Times once more. Joy: Thank you for pointing out JMJ has admitted things in writing. He has. As for “toxins” and “poisons”, that’s a problem. Botox is both, yet it’s used in medicine. Radiation is used in medicine, also. Chemo is technically poison, at a limited level. The problem is “what level”. Progressives insist on zero tolerance even when nature ignores that rule. Yet they ignore this in medicine and any area that the rule is inconvenient to them. I agree with your comments on coal, oil and poverty completely. AGW keeps the poor in poverty. Which is interesting since that’s what progressives claim to be horrified by. Except when they do it, of course. I graduated the school of slaps upside the head, and so can only use common sense in the AGW controversy. But I have never met a man who believed in “climate change” who also believed in low (or fair) taxes and limited government. This tells me a good deal about globalony. Well you know, Jersey, I operate under the assumption that everything the left hates can have an impact* on the climate. Just not enough of an impact for my taste. R. T. Shepherd: Good point. Global warming believers always point to the “experts” (those people who are surprised by everything) but when an expert makes no sense at all or is clearly motivated by something other than what he is speaking on, people aren’t obligated to listen. Wonderful. Is there a thumbs-up button? I happily endorse his application. Goodness me, context is everything. Which was my point. Pollution is by very definition bad. That is how it gets a bad name! So you are tilting at windmills and won’t find anybody to argue with you about it except in a kind of false debate. Cyanide is a poison. Should it be banned? It is present in saliva, by the way. CO2 IS toxic in high enough amounts. It will cause drunken drowsiness and death in minutes. Oxygen is toxic in relatively short order if given neat or in high percentages for too many hours the patient loses their respiratory drive. it is not a toxin per se but can be given in toxic doses. (of course it is also toxic next to a lit match). The contractile tissue toxin in Botox, the drug is not considered as a toxin. Botulism is the deadly disease caused by the bacteria. It is not a toxin when the bacterial properties are manipulated and used therapeutically any more than any other pharmaceutical drug given in incorrect doses. As a basic grade some bright spark on the wards injected milk or it’s substitute into a little boy’s central line instead of the nasogastric tube. THAT was toxic! He survived despite his hospital stay for recurrent chest infection. Cow’s milk is toxic to baby elephants. If you ever have to bring one up, use coconut milk. They can also die of a broken heart. cytotoxic drugs are toxic to target cells but life sustaining in therapeutic terms. Are you advocating a ban? I misread you. You are arguing against banning, not for. My understanding is Botox can cause serious reactions if it migrates. Considering it is now used for “overactive bladder”, seems that could be a problem. Any way, I avoid it. Pollution may be “bad” by definition, but defining “bad” is the problem. JMJ thinks CO2 is pollution. So do all warmists. We need a realistic definition and since that would most likely be based on bad statistics, I can’t see that happening any time soon. The Murry Salby of probability and statistics.